Testimonials - Kidpreneurs - Young Entrepreneurs with Big Ideas! 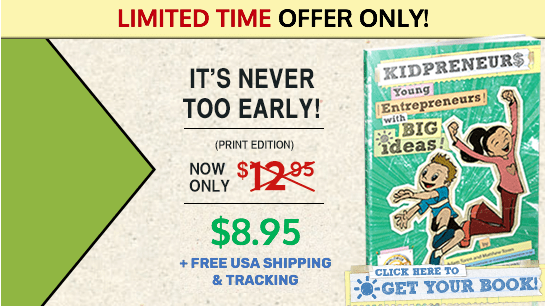 The Kidpreneurs books have received praise in the media from sources like Fox News, the Wall Street Journal, TIME for Kids, and more. In addition to the press, we have also received countless positive reviews and testimonials from kids, parents, teachers, and successful entrepreneurs. After reading Kidpreneurs to my 5 year old daughter, I felt empowered myself! My daughter Natasha enjoyed the illustrations and the idea of having her own business. She loved it. At first I thought this book may have been written for a younger audience than me but after I started reading it, I couldn’t put it down. I now realize why my Dad ordered it for me. I loved the book and plan to get busy on my first business venture! This is definitely one of the most important books for kids to read! Kidpreneurs are truly the future Entrepreneurs of the world and in today’s economic climate, they are needed more than ever! Entrepreneurs & Small Business Owners are truly a super important ingredient in creating jobs! Thank you Matthew & Adam for writing this book and sharing your passion for Entrepreneurship. This book really made me think about all of my potential and I have already started writing down ideas for my first business. I plan on talking to some of my best friends to see if they would like to partner with me. The Toren Brothers delivered a fantastic book that children and adults will find useful for years to come. This book made me feel good about my creative ideas. I am a KIDPRENEUR! I read about this book online on a Mompreneurs blog and am so happy that I bought it for my kids (Ryan 8yrs old & Tommy 10yrs old). Its great to see them sitting down and planning out a business together! Just finished reading Kidpreneurs and must say, I was very impressed with the writing style, the illustrations and the message that the Toren Brothers convey in this extremely important book. They not only covered Entrepreneurship in a way that kids will understand but they also helped them understand the importance of giving back through charities & communities and they even touched on the environment and being a green Entrepreneur. Loved it from start to finish and will be buying a copy for each of the Teachers in our School and encouraging the kids to read it. I would definitely recommend Kidpreneurs to my students and their parents. It was truly inspiring.